I used one large bead and 22 small beads. The wool was inherited; a 3mm size crochet hook seemed to work fine. The bracelet is crocheted all in one piece starting from the loop end. 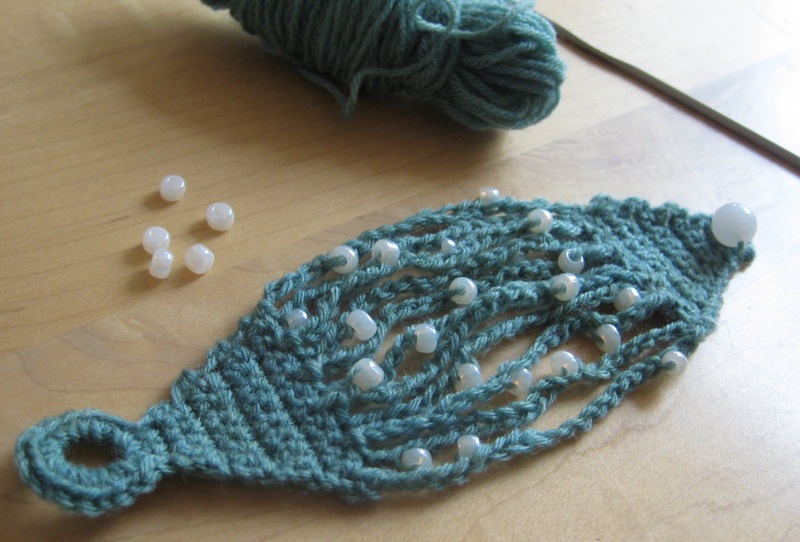 Thread the large bead on the wool first, then the smaller ones. When you get to row 10 of the pattern add the beads by sliding them up the wool and chaining as usual around them. I just added 2 beads at random per strand (each chain 20 is one strand). If you want a longer bracelet just add extra chains to the strands, or add a few extra rows of 3sc before row 19 to get a perfect fit. Chain 6 and join with a slip stitch (if you are using a larger bead chain more and modify row 1 below as instructed). Row 1: ch1, sc into ring 18 times (or 3xnumber of chains in ring), join with a slip stitch into 1st sc, ch1, turn. Row 10: sc in 1st st, *Chain 21, sc in 2nd chain from hook (1 strand made), chain 20, sc in next st on row 9 (1 more strand made), sc in next stitch, repeat from * 5 times, (10 strands made), ch 20 (11 strands made). Have a play with this as you can wear it in a couple of different ways. To plait it see my tutorial. Let me know what you think, this is my first ever written pattern and feedback is welcome! i think ya did a very good job with this pattern. i really like the style of the bracelet. Love the braclet. Can’t wait to try it. Just the type bracelet pattern I’ve been looking for. Thanks for sharing. Thanks! Hope it works well for you. Just wanted to let you know I made your beaded chain bracelet. However, I used #5 gold metallic thread with size F hook and 6mm pearl beads. It turned out great. No problem with pattern. Thanks again for sharing your wonderful work. This is lovely. When you refer to the part of the pattern (Row 11) “twist for a textured look” is this where you would plait the strands before continuing? If not, how would the plaiting be accomplished afterward? Hi Judy! I plaited my strands afterwards by separating into three groups (4 strands, 3 strands, and 4 strands) then plaiting as normal, but then the other end gets sort of revesrse plaited. I just poke it through a couple of times to untangle it. This has the effect of turning the wrong side to the front if you only do one plait. I have written a tutorial for this now to show what I mean because it is easier to see than explain in words! Let me know if this doesn’t help, I will see if I can explain better. I found your pattern on Ravelry and i love it! My bracelet turned out great and I’m going to make many more of them! Thank you for your lovely pattern!